"If you shoot me, we will both regret it, I assure you." In the 1930s and 1940s the "Oriental detective" genre flourished, with many of these cheap mysteries being churned out with Occidentals in the lead roles. One of the notable series was the Mr. Moto set of eight films starring Peter Lorre, based on the literary detective created by J.P. Marquand. Unfortunately for Lorre (or perhaps fortunately, since he was as a result able to move on to more profitable and less typecast work at Warner), Moto was a Japanese detective, and with World War II on the horizon, his character was no longer viable in the American cinema, though Charlie Chan and Mr. Wong continued on without abatement into the war years. This set collects four of the first five Mr. Moto films starring Lorre, in beautifully-restored renditions. The first picture in the series, Think Fast, Mr. Moto (1937), gets things off with a bang, as importer Mr. Kentaro Moto investigates a smuggling ring undercover. His adventures take him via steamship to Shanghai, where he must confront criminal mastermind Nicolas Markoff (sinister Sig Rumann). Providing comic relief is the ne'er-do-well son of the steamship line owner, Bob Hitchings (Thomas Beck), who spends the movie perpetually inebriated and in pursuit of blonde songstress Gloria Denton (Virginia Field). The story is told economically, with the same brief running time that all of these pictures share, and as a result never really lags. 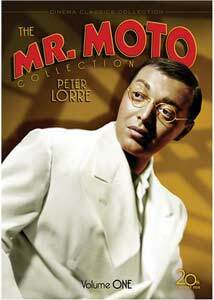 They're entertaining, and Lorre's portrayal of Moto makes it clear he's quite conscious of the racism of the whites that he deals with and he subtly (and sometimes not so subtly) punctures their self-estimations. Mr. Moto becomes a precursor to James Bond in the second installment, Thank You, Mr. Moto (1938), wherein he flat out kills three bad guys (and this after the Production Code was instituted!) True, he knocked a baddie overboard in the first intallment, but that was ambiguous as to whether it was intentional, and it was arguably in self-defense anyway. This time, he is investigating a ring of thieves headed by Koerger (Sidney Blackmer), who are after the 14th-century scrolls held by dragon lady Madame Chung (Pauline Frederick) that show the location of the tomb of Genghis Khan and a treasure trove worth ten million dollars (back when that was real money). While they will stop at nothing, Moto is just as dangerous an adversary, using jiujitsu and gunplay to his advantage, while managing to get shot twice himself. Sig Rumann returns in a small role, and Thomas Beck is also back though also as a different character, a government code cracker. He's not nearly as entertaining this time around, though. John Carradine is memorable as a huckster selling phony Chinese antiques (and he can also be heard dubbing one of the Chinese archaeologists in the prologue). The longest of the four pictures in the set, it also satisfies with a number of twists that will keep the viewer guessing. Archaeology again raises its head in Mr. Moto Takes a Chance (1938), the fourth in the series. The third, Mr. Motos' Gamble (1938), a hastily-rewritten Chan picture, is apparently being reserved for volume 2 for unstated reasons; the omission is not serious, though, since there is virtually no continuity from one picture to the next. Here Mr. Moto is digging at Angkor Wat, and simultaneously investigating suspicions of revolt of the locals against the French colonial powers. Moto is at his most complex here, playing a dangerous game (at one point, in disguise, he arranges for his own murder in order to ferret out the miscreants). The supporting cast is interesting, starting with Rochelle Hudson as Victoria Mason, an Amelia Earhart-type character, intending to fly solo around the world when she crashes near Moto's camp. Robert Kent and Chick Chandler are a comical movie team that appears modeled after Schoedsack and Cooper. The production values let the picture down somewhat, with a highly unconvincing studio jungle visible in far too much of the running time. Moto's impersonation as an aged guru on a pilgrimage is pretty entertaining, however, and gives Lorre a chance to ham it up even more than usual. A very fun entry in the series. The final film in the set, Mysterious Mr. Moto (also 1938), finds the hero deep undercover, pretending to be Japanese murderer Ito Masuka, and getting himself sent to Devil's Island so he can arrange the escape of fellow prisoner Paul Brissac (character actor Leon Ames). When Brissac flees to London disguised with a forged diplomatic passport, Moto/Ito goes along as his houseboy, keeping close in order to learn who is the ringleader of the League of Assassins that Brissac is involved with. Although the racism of other characters has been deftly dealt with before in the series, it takes on an ugly air in this picture, when Moto is harassed and assaulted by several thuggish pub regulars. It's one of the more surprising and straightforward indictments of racism I've seen in a 1930s picture, and it more than makes up for any sensitivity that might be felt about the Hungarian Lorre portraying a Japanese detective. The shortest of the four films, it rockets along with numerous twists as Moto works both with and against Scotland Yard. Image Transfer Review: The full-frame picture looks quite good for aged, low-budget films such as these. Extensive restoration has been performed to clean up a good deal of wear, printed-in dirt and scratches, making them comparable to the restored Rathbone Sherlock Holmes films in appearance. Greyscale is very good, with nice warm black levels and no blown-out whites. The only defect is a softness attributable most likely to later-generation elements being used. One cannot reasonably expect such films to look significantly better than this, and fans of the series should be delighted. Audio Transfer Review: Both mono and stereo English tracks are provided; there's not a great deal of difference although the stereo feels less constricted and compressed by comparison, with a wider soundstane. Nonetheless, directionality is virtually nonexistent. There's a mild amount of hiss and modest noise, but nothing beyond what one would expect for films of this vintage. On the whole, they sound reasonably good, given the circumstances. The latter two pictures are quite clean from the audio standpoint. Extras Review: Each of the four discs contains a germane featurette or documentary, presented in anamorphic widescreen. The Dean of Hollywood Stunt Men (12:09) is primarily an audio interview with Harvey Parry, who doubled for Lorre during almost his entire Hollywood career, including the Moto films. As is revealed in another documentary, Lorre was in poor health and was very dependent on Parry for the many action sequences in these pictures. Several other unheralded participants in the films are given fuller documentaries. Sol Wurtzel: The Forgotten Mogul (16m:32s) provides a look at the man who started off as William Fox's personal secretary, moving on to being a B-movie mogul of 20th Century Fox, outlasting Fox himself. Directed by Norman Foster (21m:14s) examines the life and varied career of the man who both wrote and directed all four of these pictures, and who would put his B-movie experience to good work in such classic television series as Davy Crockett, Zorro and Batman, as well as collaborations with Orson Welles such as Journey into Fear and the never-completed The Other Side of the Wind. Finally, The Mysterious Mr. Lorre provides an overview of the star's life and career, with a great many rare stills dating back to his European stage career. It's a sympathetic rendering, narrated by biographer Stephen D. Youngkin. It features an oddball tag piece after the credits, a Ritz Brothers routine that has them impersonating Lorre, Charles Laughton and Boris Karloff as "the Horror Boys of Hollywood." Each disc also includes a restoration comparison (identical on all four), and the trailers for the first two Moto pictures. A set of four minor gems, with plenty of action and some surprisingly modern attitudes. The restorations are sparkling and the extras are worthwhile examinations of four men who haven't previously been given their due.